The border between Tadjikistan and Uzbekistan not only is a political border, but also a topographic one. While cycling the last kilometers in Uzbekistan we see diffuse silouettes of mountain ranges on both sides of the road. The closer we get to the border, the more obvious these silouettes appear. When we reach the border post, I clearly recognize a valley, which we will follow. At this stage, we could not imagine that – 30 days later – we will have cycled 20.000 meters in altitude. Luckily crossing the border is completely hassle free. Registrations are not checked by the Uzbek officials – theoretically all travellers have to proof a hotel registration for every single day they spend in Uzbekistan. As we of course just camped somewhere in the desert and therefore missed a lot of those registrations, i did some registration-fakes on the computer and printed them out. But this now turns out to be an useless exercise – no one is interested in seeing a single hotel registration. The Tadjik border post consists of just a single, old container. I imagine how cold it must be here during winter, and i am therefore not jeallous at all about their – maybe quiet and relaxed – business life on this border post. A group of trekkers from the Ukraine is crossing the border the other direction. 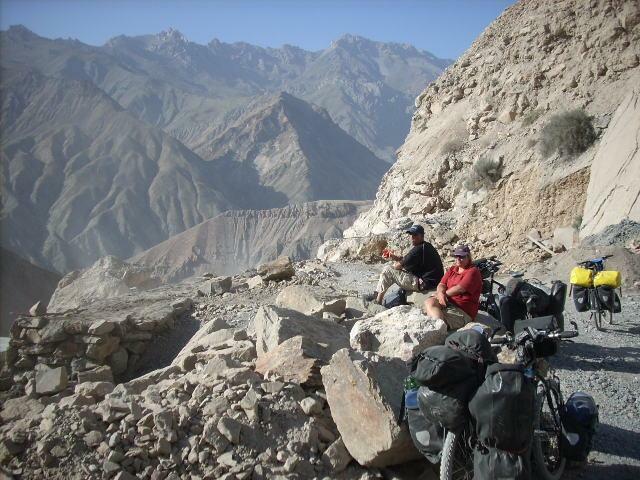 They were hiking in the famous Fan mountains – mountains Dirk, Bine and me will also cycle during the next time. I am looking forward to this! But first of all we again have to go through ex-russian bureaucracy. Also in Tadjikistan every tourist has to register at an Immigratioin office within the first 3 days of staying. Today is a Sunday, therefor we are forced to cycle through Penjinkent, the first town we reach within this country and where we hope to get the damned registration, and pitch up our tents in the fields a few kilometers outside. On the next day we luckily succeeded in getting the registration – it just took 3 hours and costs 25 Euro per registration. Afterwards i enjoy the great, lively bazar, where Bine and me are buying everything for the next days in the remote mountain area. In the afternoon we are “really” heading off into Tadjikistan. Very obvious since the beginning of cycling – the people are much more quite and not that “communicative” than the Uzbek people. And the supply of food and basic stuff is worse than in all countries we travelled before on this journey. In case we find one of the rare shops (which are called “Magazin” like in all russian and ex-russian countries), we see just some old packets of noodles or biscuits. Later on we realize that Chaykanas – teehouses which are like resthouses – are the place to buy fresh vegetables and bread. Tadjik people in remote villages mostly have their own stuff, or swap with other people from the same village. The section from the Uzbek border to Dushanbe, the capital of Tadjikistan, is just 200 kilometers in distance, but quite challenging 200 kilometers. The road quickly turns into gravel road, and despite the fact, that we are in absolute terms are not gaining much altitude, the road goes up and down all the time. After cycling for thousands of kilometers through flat steppe and desert, Bine and me are fascinated of the steep mountain ridges, the big and fast river, the blue sky and the great mountain panorama. We both enjoy cycling very much, we never know how the scenery will look like after the next curve. Also the campsites we find are really great. Great, steep mountain scenery in the morning for free! So we manage to cycle just about 50 kilometers a day, but there is no time pressure. Since Aserbaidschan we had a lot of time problems because of visa regulations and applying for new visa. Now we are able to enjoy cycling without this mess. some shops we use for stocking up our food we find an internet access. After a short time of surfing a man is bothering us with wanting to take a look at our passports. He then showed us his KGB Id Card. I really begin to hate this ex-sowjet controlling system. The road stays the same bad gravel road, but the increase of traffic is significant on the M34, and we do have to cycle through a lot of dusty air. Especially going uphill it is very annoying. But on some places there a bridges which are closed for trucks (for some reasons we do not know), and a lot of trucks are queuing before and after the bridge. We are allowed to pass, and can enjoy an empty road. At least for some hours, then the bridges are open again (for some reasons we do not know) and we are back in trucks-and-dust-hell. As approaching Dushanbe the construction sites are getting more and more. Chinese workers with chinese equipment are working on making an road upgrade. I guess that in about 2 years it should be finished, and you are able to go on good asfalt to Dushanbe. But at the moment it is even worse than before, and we have to cycle in deep gravel and a lot of dust. Nevertheless the surrounding landscape is still fascinating. We camp directly at a river, in the evening at a chaykana dirk and me spend some money into cold and excellent Baltika, the great russian beer and talk about todays experiences. Great! passing by at our campsite. During the night even the police climbs up, and on the next morning both vehicles have been removed. 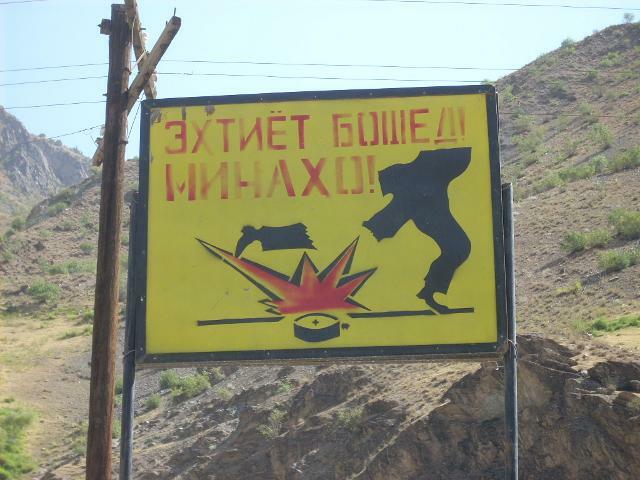 Sometimes i am really surprised how such things can happen in a country like Tadjikistan. At 4 o clock in the morning suddenly a big noise. Just 20 meters away a mine-train throws down gravel from the mountains. Puuh, good luck! On the next we cycle up to 2600 meters, and reach a new built tunnel, which has been built in order to have year-round open road. 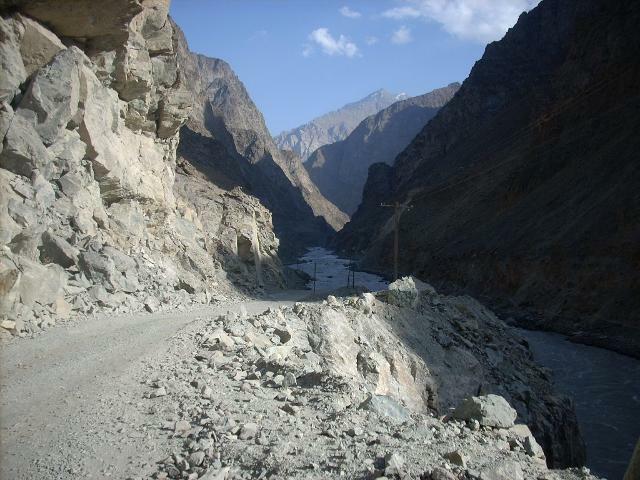 For this reason the old road up to the pass is not maintained anymore and is blocked on several places. With bicycle it is for sure possible to go this road, but nevertheless we decide to use the tunnel. 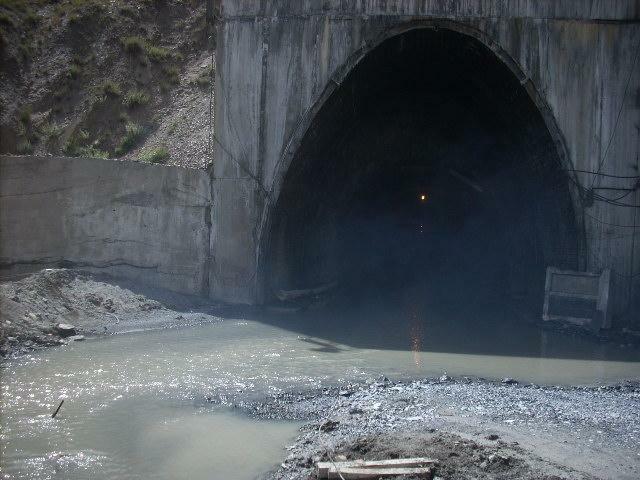 But there are some problems: on the one hand dust of truck fume is coming out of the tunnel all the time and – a little river is running out of the tunnel. It is a new tunnel, but because of some construction mistakes and/or because of technical problems water is pouring into the tunnel. Cycling the 5 kilometer is impossible. Unbelievable how this can happen, what a waste of money and – human life, as a memorial obviously shows. So we take a small, russian bus through the dark, smelly and unpaved tunnel full of water. We get out at a road-worker station, and because it is lunchtime we are invited to join their meal! The construction sites are endless, but the road is getting better. We sometimes cycle on asfalt. We then pass a long queue of trucks and cars. The reason: a section of the road is getting paved at the moment. We can pass on the side of the road, and we then enjoy an empty, perfectly paved and new road. The best road on out journey so far. 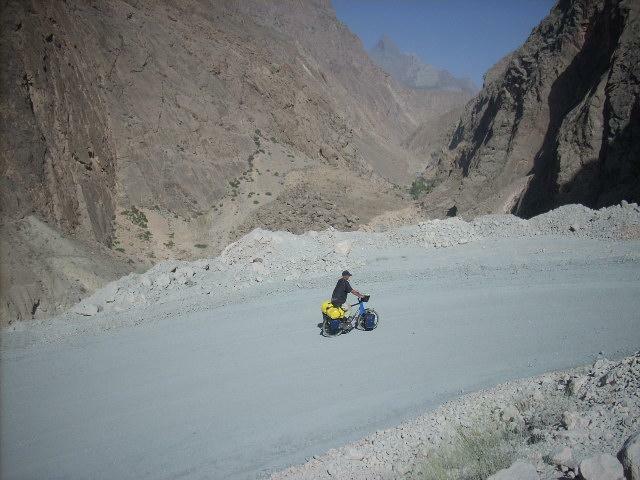 In the middle of the mountains in Tadjikistan! The last night before Dushanbe we spend directly at a river – inclusive Canadafeeling and Baltika! The we just let our bicycle roll down to the capital. Passing villages with modern villas of Dushanbes upper class people. Tadjikistan’s capital populations is “just” 600.000, and cycling into the city is therefore very easy and relaxing. It is for sure the most quite capital i ever had been with bicycle. We stay there for one night, to rest a little bit and to managing some issues. Most important to get a DHL parcel with some important stuff for Dirk and Bine. And to collect our GBAO Permit which will hopefully allow us to cycle the Pamir Highway. Beside this Bine and me enjoy the different food, especially the chickens of "Southern Fried Chicken". We also like the a square with a water fountain, where a lot of shashlik stalls are placed. We hang around there the evenings, drinking Baltika and talking. Very nice. On the day of leaving we meet some cyclists coming from the direction we go. We give and get some good infos about the routes and have some typical traveller talks. We also talk to a german guy who rent a jeep with some of his friends. He had some fascinating experiences in the Pamir, was trekking in some small, green valleys, did some fishing in a lake and had great views of the Karakol lake. Then we three take our bicycles and set off. Let’s go to the Pamir! On the first day we can enjoy asfalt. From the beginning of second day we are back on what we are used to – to the “normal” Up-and-Down gravel roads. But we enjoy the great sceneries. The richness of great landscapes is unbelieveable. I find it irrespondible that the german and the austrian foreign ministries tell their citizens not to go to Tadjikistan for security reasons. What a harm for poor Tadjikistan. Moreover it is not true at all. Good to see nevertheless later on, on the Pamir Plateau, some tourist groups. During the day it gets still very hot. And because we do not want to rush we every day rest for about 2-3 hours during lunch time. Mostly at very nice Chaykanas where we rest in the shadow on the typical “beds” where a small table is placed on for eating. Unfortunately there is not much to eat there, and it is always the same. Just soup, tea and bread, sometimes you additionally can get fried eggs. It is the same we had since months during cycling through Kasachstan, Uzbekistan and Tadjikistan. No surprise that now i easily can the count the number of my ribs...Anyway, after eating we rest for some hours to avoid cycling during the hottest time of the day. There are some small rivers to cross by bicycle. Not very difficult, also not for many mini-buses from China. 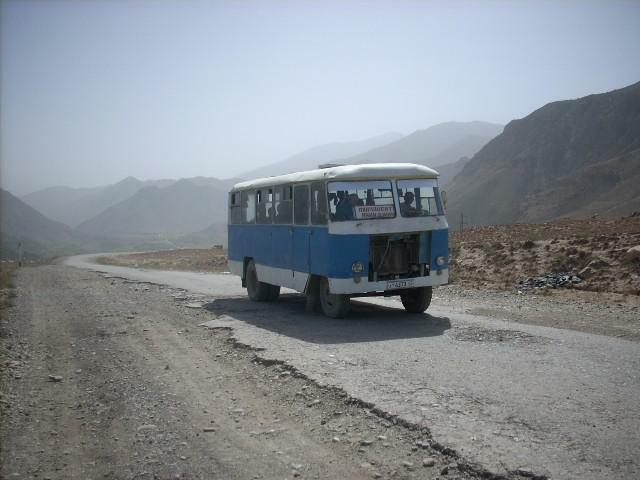 Those buses are bought in China and via Kolma Pass imported to Tadjikistan- and then driven to Dushanbe via the rough road of the Pamir. When the buses are sold as “new”, they already had some adventures on high passes and in cold rivers.... One of such a pass is now waiting for us – the 3255 meter Sagirdash Pass. And in this case, the 2000 meters in altitude we definetely have to cycle. There is for sure no tunnel! We approach with respect, and after a last checkpoint the road begins to ascend. 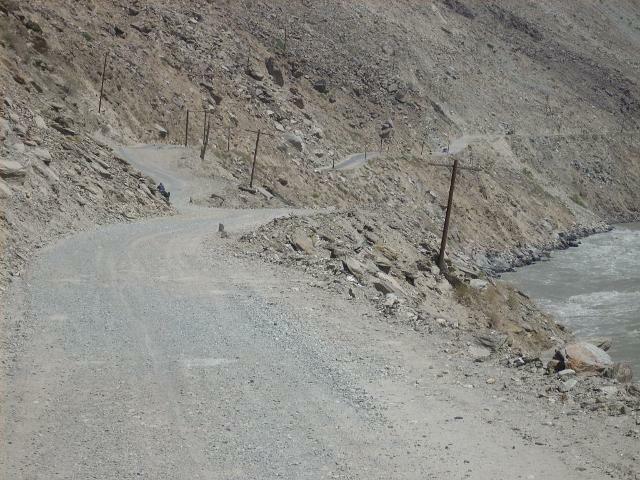 Some sections of the road are steep and the gravel is deep – very exhausting. Especially for Bine who is sometimes desperate. A great spot for having lunch high above the valley is repaying for the efforts we made. In the afternoon we reach a Chaykana where we refill water. After this we plan to camp as soon as possible. 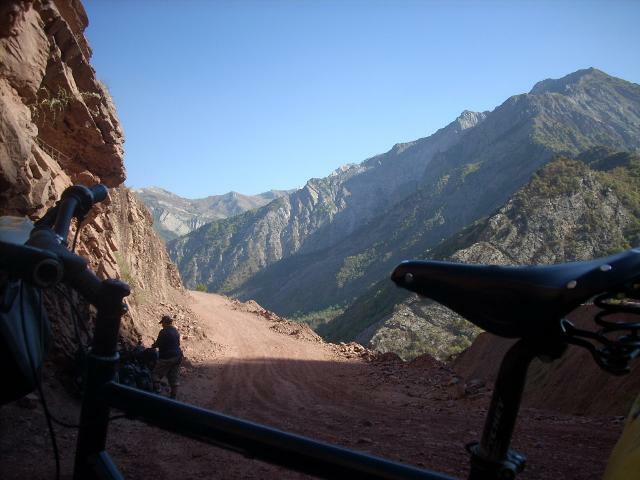 we reach the valley and on asfalt we cycle the last few kilometers to Kalaikhum, all along an turquois blue river. A nice Chaykana directly at a river and in the shadow supplies us with food and the obligate Baltika beer. 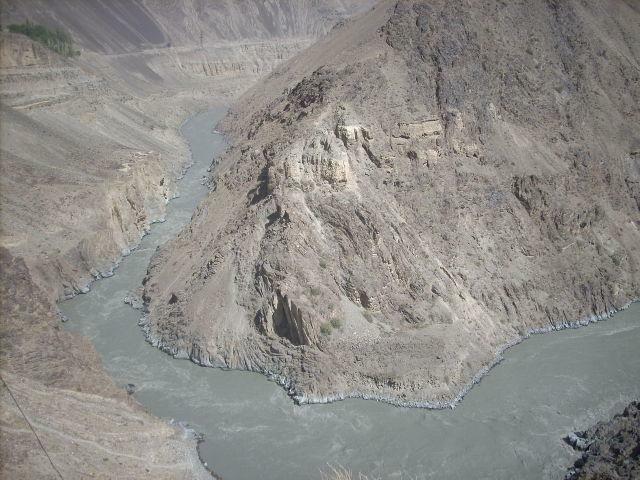 We are now following the Pang river all the way to Khorog – the one and only importan town of the region. 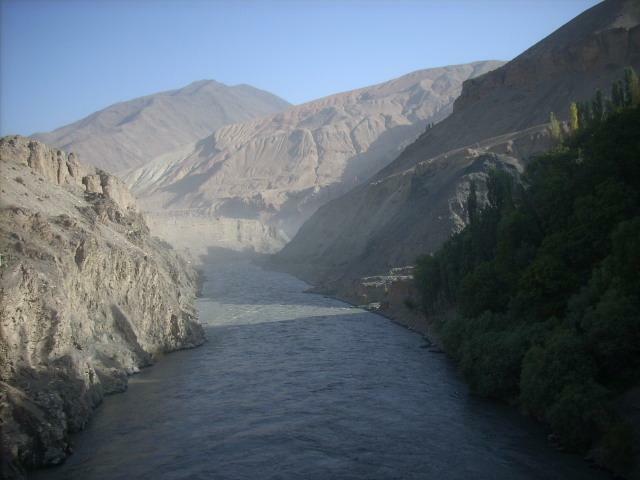 The river is the border to Afghanistan in the south. 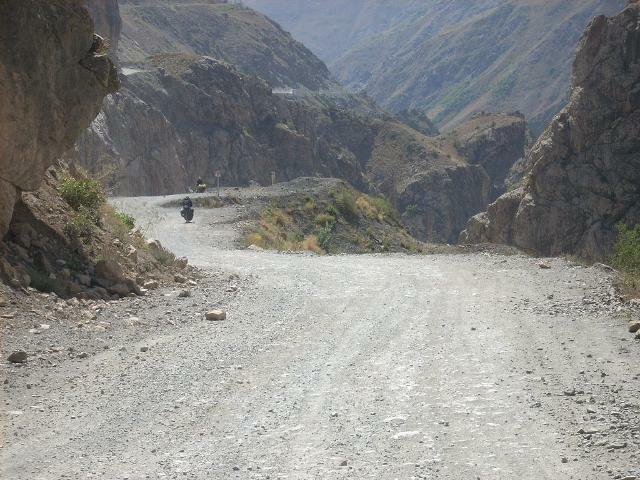 The road is old but paved, but we are cycling about 800 meters in altitude every day, it goes up and down all the time. On some places the afghan border is just 50-100 meters away. But despite the fact that it is so close it seems to be a totally different, far-away world. We see afghan men, dressed in “ali-baba” trousers, with turban on the head and beards in their faces. They are going with donkeys on very narrow paths along the river. 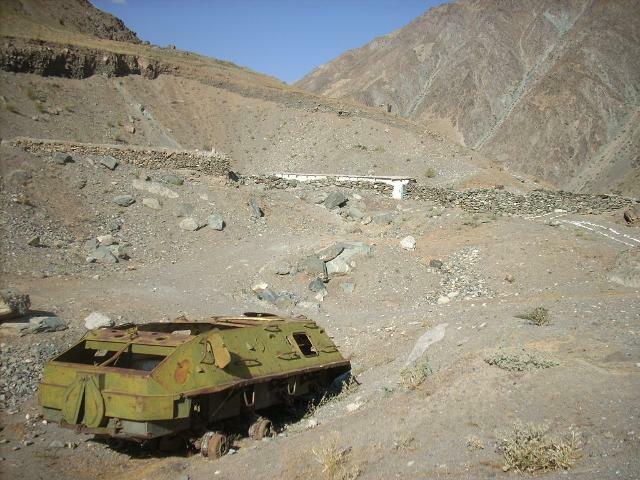 Roads are in this remote area of Afghanistan not-existent. Therefore these dangerous, narrow paths are the one and only way for traders to go to other villages. I imagine how it must be here during winter, and how many animals – or even people – have to die on these hundreds of kilometer of trails. The big river below gives nobody a chance to survive. A fascinating country for sure. A world which seems to be look like it has been also 200 years before. of landmines which are still buried in the soil on both sides of the road. Relicts of the conflicts Russia and Tadjikistan did have with islamic fundamentalist from Afghanistan. Therefore we have to carefully select a campsite for the night. 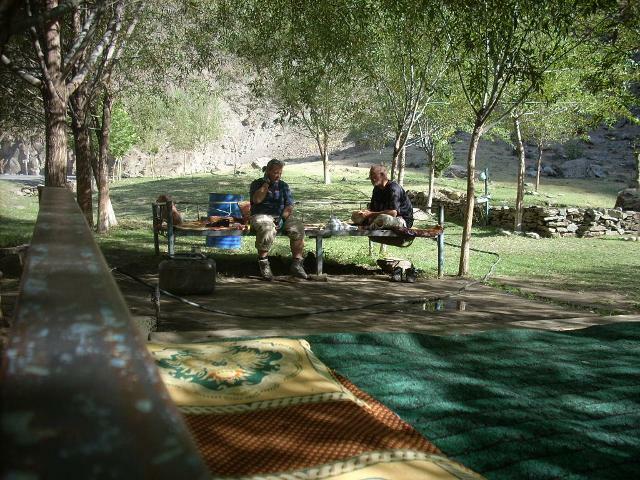 When we are not sure, we ask the locals to pitch our tent in a garden. In the first night we ask a man to sleep in his garden. He not does allow it, he also wants to invite us for tea. And before going back to his village he gives us a plate full of grapes. What a hospitality! Unfortunately some kids of the villages we are passing a bit of annoying. The behaviour is a mixture of curiousity and aggression. Some stones are also thrown into our direction. I think this will getting worse after some years, when maybe more stupid tourists are passing by. But in general the people in this area are very nice. 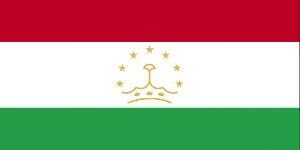 Tadjikistan is a poor country. There are not much private cars on the road, the rare shops sell just a few things, and the people do a lot of manual work, no machines are supporting them. Especially in this area we realize how poor the country is. No tractors, even no donkey carts. Therefore we see a lot of signs informing about european Charity Projects for Irrigation, Housing, Goat breeding and planting. 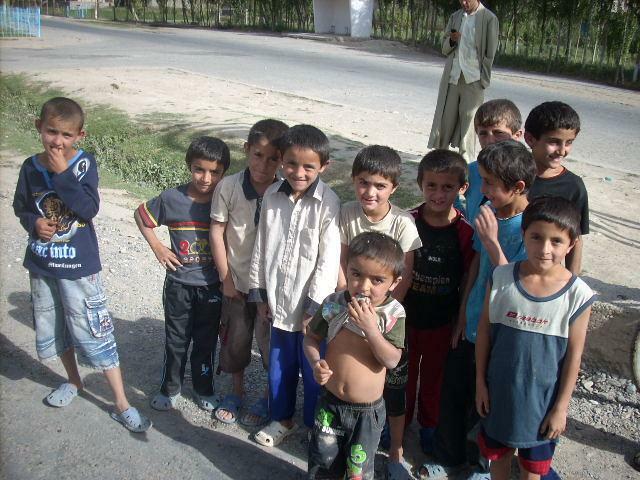 We read that Tadjikistan is now again able to supply themselves with food to about 90%. We are nearly “used” to have the great mountain scenery all time, but the interesting views to Afghanistan are still fascinating. Again i am greeting two traders, who are going with their donkeys on the small path on the other side of the river. So the last kilometer to Khorog are interesting all the time. Also because of Dirk. He on the one hand keeps us busy many times with tyre punctures, broken spokes und damaged gear shifting, and on the other hand he enjoyed to 8-percent Baltika beers (the „Baltika 9“ ) during the heat of the noon with challenging uphill cycling afterwards. He then has to vomite a lot of times and is unable to go on. Unfortunately the road on this section is extremely bad, and there is no place to sleep. I find a small place under a rock wall where we sleep without tents. The star-filled sky is nevertheless great! On the next day we eat for lunch in a small russian Kafe. We get fried eggs, and because we seldom get this, Bine orders 6 pieces of them just for her. If it is related to my consumption of one Baltika or not – i do not know. Fact is that on this afternoon Bine is cycling before me and Dirk all the time. Obviously fried eggs seem to be the “turbo” for Bine! On the next day, just before Khorog, again a dog story. Bine finds a small dog beside the road, running around helplessly. Bine stops and wants to take care of the small creature. I am against it for good reasons, as we experienced in Kazakstan that a dog is nothing for us on this journey. Luckily we find a young woman who takes care of the dog. We both think that it is a good place for the dog. Relieved we cycle the last kilometers to Khorog.